Two teenagers join a group of other students at a prestigious cooking school and find themselves falling in love in Paris. There was a lot to enjoy about this book. I'm a sucker for anything Paris-related, so I loved the setting. The boarding school/cooking program was also pretty cool; it was fun seeing these kids from all over the world live and study together. The secondary characters were so diverse and added a great friendship element to the book (especially Hampus!). The descriptions of food were just magical - I really wanted some baguettes and croissants while I was reading! Chef Michael Gibney combines his knowledge of food and years of experience in the kitchen to create a "day in the life" of a sous chef in a New York City restaurant. I'm always amazed by people who can cook - like, really cook - and I love food, so the idea of working in a restaurant has always appealed to me. After reading this book, however, I would never want to be a sous chef in a fine dining establishment. Man, it is HARD! The days are long, starting with prep hours before the doors even open, and the pressure is high. It amazed me how many people are involved, from the dishwashers to the line cooks to the executive chef, and how they all must work together in perfect harmony to keep the service moving. If one person makes a mistake, it can throw everyone else off. Timing and precision are so necessary. Adding Sous Chef to my list... sounds like a book I'd enjoy. Thanks. I love eating, but I could never be a professional cook. There’s too much pressure! Great reviews! Thanks, Aj! I totally agree. I am curious about Sous Chef. Just to hear about how it is in one day would be cool! But yeah, no thanks as a profession! Right?? So much pressure, always on your feet, no thanks! 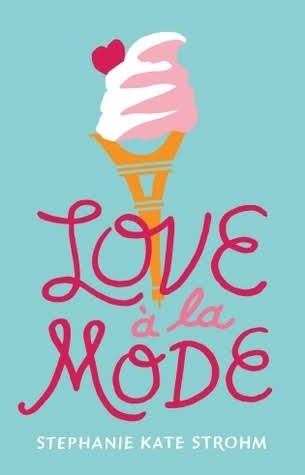 The plot of Love a la Mode sounds so fun, but the lack of communication skills is a thing that always drives me crazy. Sous Chef sounds great, though! I am so fascinated by jobs like that where everyone has to work together perfectly. I can't imagine being a professional chef. Great reviews! Thanks, Jordan! Sous Chef was so interesting, I never really thought about all the work that goes into a restaurant. Hampus? lol. I understand completely what you are saying about Love a la Mode. I haven't read it but I've read books who's conflict can easily be cleared up. But I guess when I think about it most people in relationships lack communication. I don't communicate often to people I know if they've upset me so maybe I wouldn't mind it as much. Wow, Sous Chef is that short? Crazy. It would be really fun to read. I can imagine by your description and also shows I've watched the amount of work that goes into cooking. I couldn't handle it. Yes, that is a great point about relationships! Yes, Sous Chef was so short! The glossary at the end is really long. Sous Chef is probably fascinating, but yeah sounds high pressure! And Love sounds fun with Paris setting- Paris and food are a pretty good combo haha. Other than the romance issues you mentioned it sounds like a pretty good read! It was a good read, I love anything Paris-related! Sorry Love a la Mode didn't work for you. I thought it was a lot of fun and pretty adorable, and I felt like all those missed opportunities were part of their growth, which I see a lot in YA. Yeah, I can understand that. I think I'm getting a touch burned out on YA? Aw, I'm sorry neither of these were amazing for you! I can't stand miscommunication like that in books either, so I totally understand why Love a la Mode didn't work for you! So glad someone else feels the same way! Sous Chef sounds pretty interesting, and I bet it's an especially intense profession at a restaurant in NYC. I know, I would imagine it's a really hard place to work! Thank you! I hope you enjoy it if you get a chance to read it! It was definitely a cute book that many will love! Love a La Mode sounds good but not if you got so frustrated with it. I would still like to read it tho. I also like that its set in Paris always a nice location. Sous Chef sounds good too. It must be fun set in NYC, I love that area. Great reviews! Thanks, Mary! Paris and NYC are always great settings! Love a la Mode genuinly sounds adorable but man, would the lack of communication annoy me . Yeah, I think a younger me would have been more ok with it! 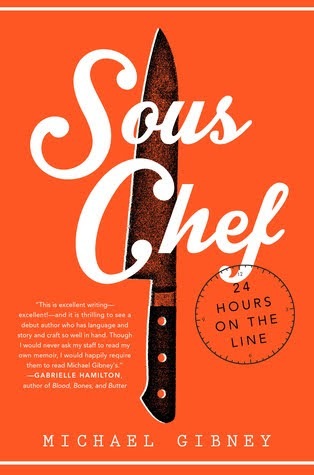 I really enjoy your food-related fiction/nonfiction pairings :) Sous Chef sounds fascinating. Totally with you on the issues with Love a la Mode!